Intigral, MENA’s leading digital hub, has today launched AFKAR.me, the region’s first full-spectrum digital sector start-up and entrepreneur incubator. AFKAR.me sits at the core of Intigral’s commitment to grow the region’s digital ecosystem, and will source, incubate and develop innovative business ideas from start-ups and entrepreneurs. The MENA region is experiencing monumental digital growth and is forecast to grow by three times to evolve to an estimated $18 billion opportunity by 2018. With the growth, has come a boom in entrepreneurship. However, while there are start-up incubators and accelerators in the region, none of them offer the full spectrum of services that entrepreneurs require. AFKAR.me is set to change this. Open to applications both from the region and globally, the initiative offers anyone with a great idea the unique opportunity to receive support from Intigral’s expertise, and an unparalleled access to the Middle East market. Interested applicants can apply online at AFKAR.me. A team of expert judges from the UAE and KSA will assess all applications, with the top ten teams invited to participate in a ‘weekend boot camp’. Over the weekend the teams will work with mentors to improve their final pitches, from which three out of the ten will be selected to develop their businesses with AFKAR.me. “At Intigral we are committed to contribute to, and support the growing digital sector in MENA. While there are a number of existing initiatives that help entrepreneurs and start-ups at various stages of their development, AFKAR.me is the first full-spectrum program developed in the region. Through AFKAR.me we are giving anyone with a great digital idea not only support at every stage of its development, but importantly direct access to the MENA market via our existing clients and investors. I would like to extend my thanks to our partners who will help us find and develop the next big thing in the MENA digital market. We welcome applications from both, the region and around the world. To apply or for more information, simply visit www.AFKAR.me”. The program will be an annual initiative with four applications a year, targeting two intakes each from UAE and KSA respectively. Importantly, if a project does not get selected they can develop on the feedback given during the boot camp weekend and re-apply to the next intake. Applications are now open until the 10th of November 2013. AFKAR.me partners will play a key role in the selection and mentorship process. 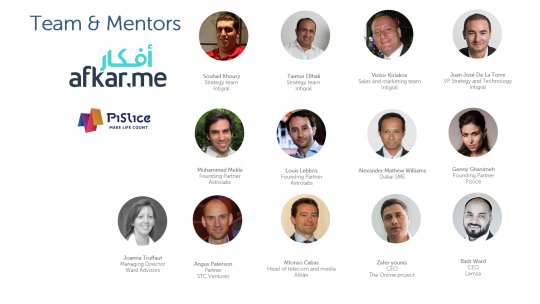 They include MBC Ventures, Wamda, Arabnet, Dubai SME, STC Ventures, Altran, The Online Project, Astrolabs, and Middle East Venture Partners. Ketchum Raad is the communications partner.